GAIL WALDSTEIN, M.D. practiced pediatric pathology for more than thirty-five years while single parenting three children for 15 years. She began writing seriously in the mid-90s. 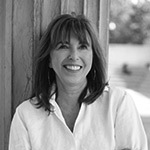 Her work appears in Nimrod, New Letters, The MacGuffin, Carve, Bayou, The Potomac Review, Harpur Palate, Connecticut River Review, Pearl, Zone 3, The Iowa Review, and numerous other journals and anthologies. Two essays have been nominated for the Pushcart. She has received fellowships from the Rocky Mountain Women’s Foundation, the Colorado Council for Arts, and the Helene Wurlitzer Foundation. To Quit this Calling, Firsthand Tales of a Pediatric Pathologist, was a Bakeless finalist and published by Ghost Road Press, 2006. AfterImage, a poetry chapbook, was published by Plan B Press. "Mind Riot" is an excerpt from a memoir involving the disintegration into schizophrenia and incarceration by a physician-husband at age 30, when she was a mother of three, and a practicing physician.